SER has more than 2,700 members and partners in over 70 countries with Chapters and Student Associations serving states, provinces and regions of North America, Europe, Australia and Asia. 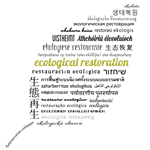 SER is committed to providing you with access to the tools, content, professional development and more to make sure you have the resources you need to conduct your critically important work in the relatively young field of ecological restoration. Find out more at www.ser.org!